Hang pictures in 60 seconds or less with Hangman Picture Hanging Kits! 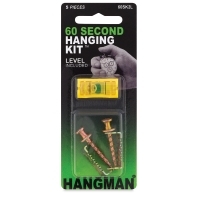 The 60 Second Hanging Kit helps you hang pictures or other decor with accuracy and ease. Each kit includes sawtooth hangers, bear claw hangers, and a perfectly sized level to make sure your artwork is hung straight. The sawtooth hangers require no nails — just tap them in with a hammer. The bear claw hangers each support up to 30 lbs when installed on drywall, or 100 lbs when installed into a wall stud. 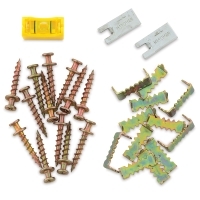 26-Piece Kit — This kit includes 12 sawtooth hangers, 12 bear claw hangers, a locator that helps pinpoint the exact installation point on your wall, and a level. 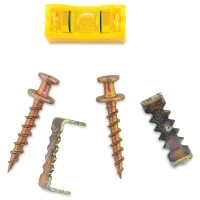 5-Piece Kit — This kit includes two sawtooth hangers, two bear claw hangers, and a level. 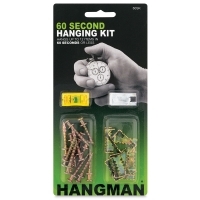 ® Hangman is a registered trademark.™ 60 Second Hanging Kit is a trademark.